A quite tearful clip, I might have lost my humanity otherwise. I remember when she hugs me every time I open the door coming home after work. Someone just gave me a piece of technical analysis information written by a research department of one big investment bank in Europe. Sorry can't disclose any names. 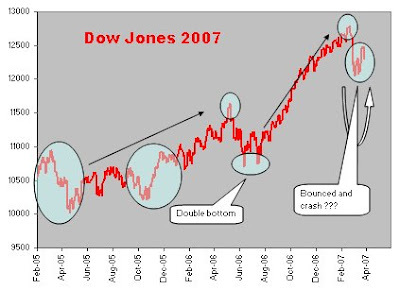 I'm still wondering why people still believe in technical analysis to guess the future stock movements without any market theory behind this. 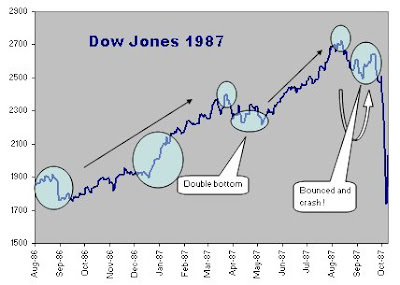 By comparing key similar characteristics between DJIA index movements prior to October 1987 crash and that recently, this analysis surprisingly suggests a possibility of stock crash the near months. Good God! Because I can't show the original document, I had to modify the graphs with data taken from yahoo finance in order to blog this. It's a technical analysis, so best just see it and don't try to think about it. Don't worry there's a system called "Circuit Breaker". Woohoo! Just wait for a couple of weeks, I'm gonna Joost around. Please check out this blog in the next couple of weeks for a Joost invitation from me. This is just to let you know that we haven't forgotten your request to try Joost. We're now speeding up the process of adding testers and we'll shortly be inviting everyone who has signed up to try Joost. This includes you, so expect an invite within the next couple of weeks - in the meantime, thanks for bearing with us - we appreciate it. See you soon on Joost! A verdict on Buyat Bay case will be held next month, 4 April 07. It's gonna be a surprising verdict considering a lot of matters capturing the social-economic issue, environmental issue, historical, even the social-political issue. It has been seemed as a fight between NGOs unfortunately supported by the Indonesian government and a multinational corporation fortunately supported by local experts/scientists/academists. 21 August 2004, National Seminar: "National Seminar and Workshop on the Buyat Bay Controversy", that were attended by a number of local and national experts. Community education and knowledge about health is very poor. The diseases found are diseases typically found in other regions, especially coastal regions, which have poor sanitation and low economic levels. The pathology of the tumors indicates benign tumors. No signs of Minamata Disease have been found. Research is needed to monitor and evaluate the community’s long-term health status. 10 May 2005, International Seminar: "Mining, environment and sustainable development: A lesson from the gold mining controversy in Buyat Bay, North Sulawesi", that were attended by 34 international scientists. The quality of sea water around Buyat Bay did not show the danger/threat to sea biota environment (link). The bay had not been polluted (link). I consulted and confirmed my aunt (MIJ Umboh) a few times to ensure the conclusions and she sticked to the genuine conclusion, that is, there is no evidence and proof of pollution. I personally support her, nevertheless, I try to see this case more in the matter of social-political. Historically, Buyat was used as an official southern border of De Minahasa from the Kingdom of Bolaang set by the Dutch in March 1756. The area of gold mining is in Ratatotok village, South Minahasa, 4 km from Buyat Bay. Buyat residenst are migrants from Bolaang and Talaud which are separated historically from Minahasa. They live from fishing. Minahasa is identified strongly with the Dutch language and connection and also the Protestant faith, in fact, that when Indonesia became independent in 1945 inhabitants of the region pleaded with the Dutch to let it become a province of the Netherlands (source). If Minahasa became a province of the Netherlands, all the gold resource might had still been owned by Nederlandsch Mijnbouw Maatschappij which started the gold mining in 1887. Supporters of Newmont and Richard Ness are mostly Minahasan scientists who have strong international links. By supporting Newmont and Richard Ness as expert witnesses, they indirectly fight the attorneys of Indonesian government represented by the local government of North Sulawesi. If local autonomy or decentralisation is the main issue here, it means that the local government of North Sulawesi under the central government of the Republic of Indonesia has to face resistance from the local scientists, who may believe in neoliberalisation. Actually, it has been offered to the people of Minahasa from the Dutch in 1945 to be the 12th province of the Netherlands. If NGOs' involvement is the main issue here, keep them away from Buyat Bay. Because they know nothing and obviously have no competency to analyse compared to the local scientists. They have strong resistance from the Minahasan scientists in terms of scientific evidence. One Malaysian blogger, Ong Hock Chuan, mistakenly identified as Indonesian blogger by another blogger, Jennifer Marohasy, has been wondering why WAHLI did not open for discussion in his blog. Ong should have realised that the scientific evidence of no pollution has kept WAHLI's mouth shut. For me, this case is quite complicated. On one side, NGOs are quite supported by the government, which is uncommon, probably because De Minahasa has a bargaining power in case of separation from the Republic. On the other side, Newmont is supported by the educated locals, who understand the value of their lands historically and culturally. Richard Ness is American and of course from the Ness family, which could be originally from Holland, otherwise Scottish. I'm not being a conspiracy theorist, but just trying to perceive some information related to the Indonesian airline business and issues/problems arising prior to and at this moment. We understand that 40% of Adam Air's stake was planning to be sold to Qantas and in Singapore market in Feb 2006. Adam Air said Friday it would sell 20 percent of its shares to Qantas. "The Australian company actually offered to buy 30 percent of the shares but we are only prepared to sell 20 percent because another 20 percent will be sold during Adam Air's initial public offering (IPO) in Singapore next year," Adam Air's chief executive officer Gunawan Suherman said Friday. 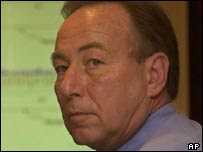 However, since Adam Air disappearance, the plan also disappeared as it's not really attractive anymore. But, what if the offer price is lowered plus significant contribution of more professional aviation management? We know that just last month (19 Feb 07) up to 49% of Garuda's stake was planning to be sold following the refinancing plan of a $749 million debt. The Indonesian government hopes the privatization of debt-ridden state airline PT Garuda Indonesia will be completed in the first half of this year, a minister said Monday. The government announced earlier this year that it is seeking strategic investors to purchase up to 49% of the flag carrier. Surprisingly, the last wednesday (7 Mar 07) fire which burnt 21 passengers seemed to still flame the spirit of privatisation. The Garuda Indonesia air disaster on Wednesday appears to have had minimal commercial effect, with few ticket cancellations and a commitment by the airline to push ahead with its privatisation program. Of course the value is getting lower after now and 49% may influence almost half of the management. If both plans are carried on and Adam Air or Garuda is going to be half-managed by foreign airlines which are believed to be more capable in terms of safetiness, then customers confidence may reach a considerable level for Adam Air or Garuda to win the competition. Although, high air fare is the consequence. This may be followed by other Indonesian airlines. Interesting story from The Age pointing out Indonesia incapability to read Garuda black box was admitted by the former head of Indonesia's National Safety Committee, Prof Diran. "The black box is being recovered and I think (brought) to Canberra," Professor Diran said. "The Australian Government proposed to get a read-out in Canberra, we accept that of course because we don't have the facilities for that." From now, Indonesia government is supposed to have been thinking in buying "the facilities" from overseas. One new customer for the suppliers, one new item in the budget. Remember the tsunami buoys. If we google "aviation consultants", there is a huge list for it. Some may put interests in Indonesia. Or, to improve the whole aviation infrastructure (air-traffic controllers, pilots, cabin crews, support staff, airports management), some aviation consultants might be considered to be hired. One business opportunity opens in Indonesia. Airline business is a big business in Indonesia boomed in 2000s, similar to the oil business boomed in 1970s with similar experience in how some foreign corporations entered the onshore and offshore oil business in Indonesia. The difference is that the target now is domestic market. There could be a battle of two sides between a group who is trying to make airline and aviation business not attractive ("unattractive group") for foreign investors and another group who is trying to make it attractive ("attractive group"). If both accidents are the results of sabotage as some people first thought, it could have been set by "the unattractive group". However, considering the lower valuation could have been impacted in the offering, this might have become even more attractive. Otherwise, this might have been planned by "the attractive group" for the purpose of lowering the offer value. We may allow five years time from now to see the development of airline and aviation business in Indonesia. We can see which airlines or airports are going to be controlled by foreign investors and which are not. We may also consider national conglomerates to take control. Indonesia has 23 active domestic airlines and 213 airports with 21 international airports.